Hero MotoCorp will be launching the XPulse, which was showcased as a concept at the 2018 Auto Expo, by the end of this year. It is set to be the most affordable motorcycle that’s designed to tackle the rough stuff. Designed to be more powerful and capable than the Impulse, the XPulse shares the same engine as the Xtreme 200R. The 199.6cc single-cylinder in the Xtreme makes 18.4PS at 8000rpm and 17.1Nm at 6500rpm. It works in conjunction with a 5-speed transmission. Although the power output may not seem adequate, the motorcycle should be fun to ride on trails thanks to a low kerb weight of 140kg. It’ll also be equipped with a single-channel ABS for added safety. However, we’d love to see a dual-channel unit in the production motorcycle, at least as an option. We expect the XPulse to be priced around Rs 1 lakh, ex-showroom. Just after BMW Motorrad started accepting bookings of the G 310 twins in June, KTM announced that it will be launching the 390 Adventure in 2019, enthralling us enthusiasts throughout the country. It’s the most anticipated motorcycle in this list as it is based on the extremely capable 390 Duke. However, it is not simply going to be a Duke on stilts. KTM has completely reworked the 390 Duke’s trellis frame to withstand the additional beating. This coupled with off-road spec underpinnings and a powerhouse of an engine would make the motorcycle pretty much unstoppable. Figuratively speaking, of course! It also gets a dual-channel ABS and spoke wheels. The 390 Adventure is likely to command a price tag of around Rs 3 lakh (ex-showroom) and will go head to head with the less powerful yet more expensive BMW G 310 GS. Benelli has received a shot of adrenaline under its new management, Mahavir Group. Now, the Italian manufacturer is back in action in the Indian market. Benelli has planned a host of products that will be launched by the end of next year, and one of them is the TRK 502 X. The 502 X is an off-road-oriented variant of the 502, complete with spoke wheels and a 5mm longer stroke for the rear monoshock (50mm) than the 502. The front inverted forks, on the other hand, get 145mm of travel. Drawing power from a 500cc inline twin-cylinder engine, the motorcycle comes with a 6-speed transmission. The engine makes 47.6PS at 8500rpm and 45Nm at 5000rpm and returns a claimed efficiency figure of 25.6kmpl. We expect the TRK 502 to be priced around Rs 5.2 lakh (ex-showroom). It could be a better alternative to the Kawasaki Versys-X 300. The Benelli Leoncino 500 Trail also shares its engine with the TRK 502 and makes the same amount of power and torque as well. However, at 23.2kmpl, the motorcycle’s claimed efficiency figure is slightly lesser than the TRK’s. This could be due to the Leoncino having different gear ratios when compared to the TRK. Being a scrambler, the Leoncino would be apt for those who are looking for a fun motorcycle that isn’t too bulky like run-of-the-mill adventure tourers. When launched (likely at the beginning of 2019), it is set to become the most affordable scramblers in the country. Speaking of affordability, the motorcycle is likely to be priced at around Rs 4.5 lakh (ex-showroom). Other notable features of this motorcycle include an all-LED lighting system, retro-modern styling and comfortable ergonomics. Compared to the standard Leoncino, the Trail variant features spokes on aluminium alloy rims. At 210kg (kerb), the Leoncino Trail is also lighter than the TRK 502X. In the last couple of years, Suzuki has been actively trying to introduce more competitive big bikes in the country starting with the legendary Hayabusa. The Japanese auto major then introduced another locally-assembled motorcycle, the GSX-S750, in April this year. Upping its ante, it now plans to launch the V-Strom 650 XT via the CKD route later this month. It would be the brand’s first mid-capacity adventure motorcycle in the country and is likely to be priced around Rs 8 lakh (ex-showroom). 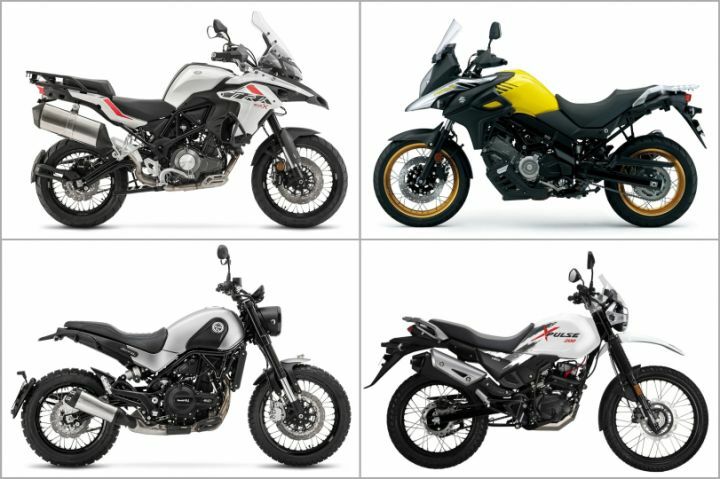 The V-Strom 650 XT is likely to be a more capable ADV off the road when compared to its only rival, the road-biased Kawasaki Versys 650. Key features of this motorcycle include spoke wheels with tubeless Bridgestone Battlax Adventure tyres, low-rpm assist and a three-mode traction control system. Further enhancing the touring capability is a large 20-litre fuel tank. The 645cc, liquid-cooled, V-twin engine is good for 71PS at 8800rpm and 62.3Nm at 6500rpm, while a 6-speed gearbox sends power to the rear wheel.